A Tongue in Cheek Look at Car Buying Glossary. A Tongue in Cheek Look at Car Adverts in The Internet Age. In the time I've been doing this, and quite a few years before that, simply as a car addict, I've learnt, mostly by experience and through many wasted trips, that sometimes, car adverts, both trade and private, and especially for some reason on a well know auction site, are sometimes not all that they seem! So, at the risk of sounding like a grumpy old man (well, I am 50 this year!) I've decided to share these experiences and annoyances, albeit in a tongue cheek manner, so hopefully you can benefit from them, as well as having a bit of a giggle too. The "x" doesn't work, probably a fuse or a switch. Real Meaning: It's not a fuse because I've already tried it. For example, when I first started doing this, I bought a BMW 850Ci that had a few electrical problems, and was described as such. That ended up costing me nearly £1500 and many hours of diagnosis to fix the myriad of problems that car had. Timewarp Condition/Out of The Box. The single most overused term currently in use; there can't be that many barns in the country!. It covers everthing from a totally unsalvagable wreck right through to something that requires minor re-commissioning work. 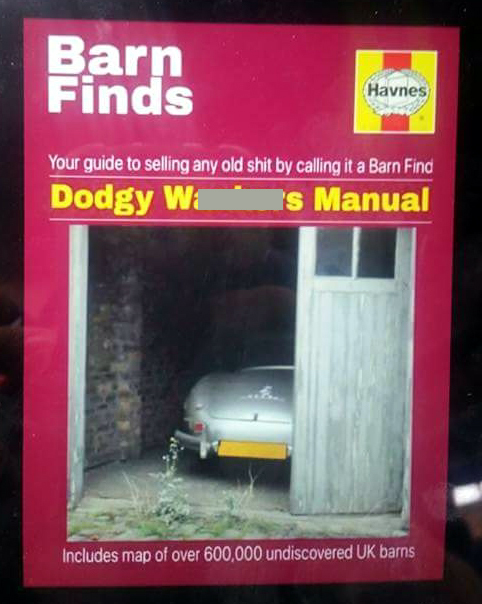 I think quite a few sellers have been reading this particular Haynes Manual (click to view). Real Meaning: This is much overused term, and in all my years doing this, I have only seen a handfull of truly "mint" cars. Another totally meaningless term, unless theres a packet of extra strong mints in the glovebox, that is. Nobody can ever say that any car, however good (unless it's brand new, or been kept in a vacuum) can be totally free of any rust. Its absolutely inevitable there will be a rusty suspension component or bolt somewhere. This is term that's becoming far too freely banded about of late. When did you last see one of these. Real Meaning: I don't have much (if any) formal service history, but I've been on the VOSA website and printed off the vehicle's MOT history; this service is free, and is available to everyone. Get your very own "Full VOSA History" by Clicking Here. I "brought" this car last year/month/week. I think this may be a Midlands thing, so forgive me if I'm missing something here, but I was always taught the correct term is bought!!!! Sorry, but this is a real pet hate of mine. The words should be used as such; "I bought the car, and then brought it home"
Needs nothing doing, just get in and drive. Real Meaning: This is never true with old cars. In the 11 years I've been doing this, I have never (stress never) bought a car that doesn't need at least something doing to it. Real meaning: The vehicle looks like its been in a stock-car race, but it looks ok if you stand 10 feet away. I bought it for the wife, but she can't get on with it. Real Meaning: I bought it last week, and either the seller is a trader posing as a private seller, probably to hide from their commercial responsibilties, and/or has bought a car and realised its "not in the best order" . Don't get me wrong, I've nothing against people making a few quid, but if you are buying and selling a few cars to make some extra money, just be honest about it!. The car has been dry stored for X months/years/decades. Real Meaning: In the most cases, but not all, this usually means its been stood neglected somewhere for ages. The car is running a bit rough and probably needs a service. Real meaning: I've had it to the garage and they say its beyond economic redemption so I'm selling it before it completely gives up the ghost. There's bit of surface corrosion and/or minor blistering/"blebs". Real Meaning: The area is rotten. In my experience 90% of paint blisters on bodywork, usually result in rust holes. Usually means its rusty, but there's no holes yet...some will be along soon though! What should it drive like if it doesn't? Talk about redundant words!. How many miles aren't genuine then?. Again redundant words...is it possible to have owners before it was new?. I feel like one of my old English teachers here, but these words are so frequently used incorrectly. For clarification Their, meaning belonging to them; as in "their car". There, as in ; "over there " or "are there any spare seats here?" and finally They're, as in "there are", as in "They're all over the place". My English teachers were sticklers for proper use of these words. Milage, Millage, Molliage etc etc. Overuse of the word "WOW". Means nothing and looks stupid, and used simply to fill the page. Writing whole adverts in Capital Letters. That's actually regarding as SHOUTING in computer language.